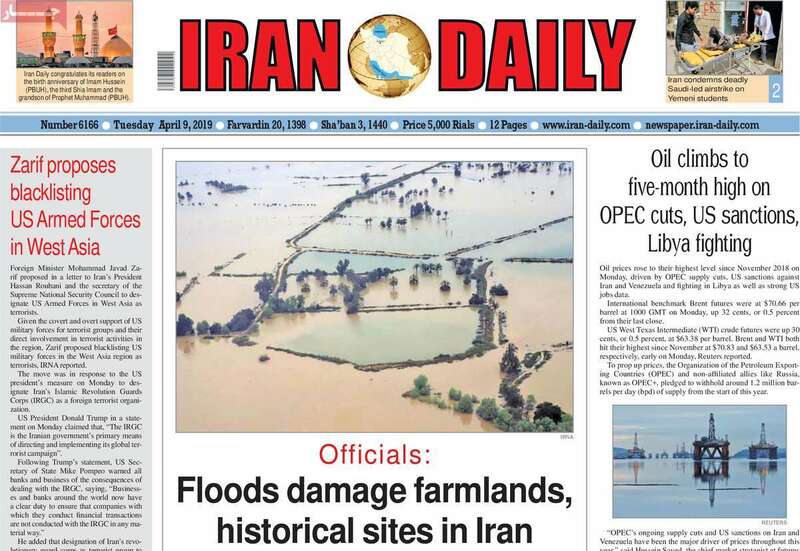 Tehran, April 8, IRNA- Three intense weeks have past since Iran has been hard hit by flash floods that have taken the lives of dozens of people and left a huge trail of destruction behind. International aid supplies have been sent from several countries but no cash donation has been received due to the US sanctions. Many regional countries have announced their readiness to help the Iranian Red Crescent should there be a formal request. Afghan and Azerbaijani Red Crescent as well as the United Nations Office for the Coordination of Humanitarian Affairs (OCHA) have all announced they will help Iran in addressing the consequences of the natural disaster. However, several countries have already sent in their humanitarian aid and some others are preparing it or finding out ways to coordinate efforts to help those affected by the floods. German Red Cross has shipped 40 lifeboats with outboard motors as well as 80 sets for water rescuers such as helmets, vests and boots. The consignment also includes nine river rescue kits, containing ropes, backpacks and pulleys. The Iranian Red Crescent Society has confirmed receiving the cargo. Logistics Deputy of the Red Crescent's Relief And Rescue Organisation Saeed Matani says "80% of the equipment will be used in Khouzestan Province". Flash floods are currently hitting the southwestern Khuzestan Province, home to nearly five million people. Officials have ordered evacuation of thousands of people in two counties, six cities and more than two hundred villages in the region. Also, Turkish Red Crescent has sent five trucks of aid supplies to Iran flood-affected regions. The aid includes 320 tents, 500 bedsteads, 100 hygiene kits, 1,625 blankets, 360 kitchen kits and 60 stoves. Red Crescent's Relief And Rescue Organisation says the aid has been handed out to the inhabitants of Tazeh Abad village, Aqqala county in the northern province of Golestan that was the first to be hit by the flash floods. The northern region is still trying to recover from the disaster. 70 people have lost their lives in the recent deluge, thousands of others injured and hundreds of thoudsands left homeless following three weeks of the deadly floods that started in northern Iran and moved west and now going down towards southwest. Swiss Humanitarian Aid Unit has sent two tons of shipment to flood-hit areas. The relief items include: two water modules that can supply drinking water to 10,000 people per day as well as five water disinfection kits. Norwegian Ambassador to Iran Lars Nordrum met last week with Iranian Red Crescent Society to coordinate efforts on what is needed most for assistance. He said Oslo is ready to offer a helping hand should need be. Kuwaiti Emir Sheikh Sabah al-Ahmad al-Jaber al-Sabah ordered the country's Red Crescent Society to send aid to flood victims in Iran. The Persian Gulf country has already sent two consignment of aid supplies to Iran. The Kuwaiti aid includes medical and food supplies. The first consignment, weighing 40 tons, includes four water pumps, 600 food packs (23 kilograms of rice, sugar, dry milk, edible oil, macaroni, salt, green peas, dates, beans, sardines and lentils). The second shipment, 35 tons, contains one thousand 23-kilo packs of foods for families, 600 food packs weighing 10 kilos as well as 200 five-kilogram rice packs for affected families. The Kuwait Red Crescent has also sent five tons of pharmaceuticals and medical equipments. France has announced it will deliver aid supplies to the Iranian Red Crescent in the coming days to be used in Iran's flood-hit regions. The aid includes 114 motor pumps, 300 kitchen kits and 5,000 blankets. In the meantime, the Russian Emergency Situations Ministry has also sent aid supplies, including four thousand tents, blankets and folding beds to its regional station in the Armenian capital Yerevan. "Responding to Iran's request and in joint cooperation with Armenia's Emergency Situations Ministry, humanitarian aid for the people hit by the floods has been sent," reads Russia's Emergency Situation Ministry statement. The Russian government created the centre in 2015 in the city in a bid to serve as a regional basis for humanitarian aid for Armenia and surrounding countries. The European Union has announced an initial amount of �1.2 million in response to the floods in Iran. The cash donation will be sent to the International Federation of Red Cross and Red Societies Societies to be later transferred to the Iranian Red Crescent Society. However, due to the US sanctions, no monetary transfer will be realized to Iranian accounts. The Iranian Red Crescent says it has not received any cash donation. "No foreign cash aids have been made to the Iranian Red Crescent Society, as there are basically no financial channels for such purpose," said the Iranian Red Crescent in a statement. "Even though, certain countries and organisations have announced their readiness to offer cash contributions, given the inhumane US sanctions against Iran, there is no channel for cash aids to be sent to IRCS as of this date," it added. "There is no obstacle for sending or receiving relief consignments, but cash donations are still not possible due to the US sanctions," according to the statement. 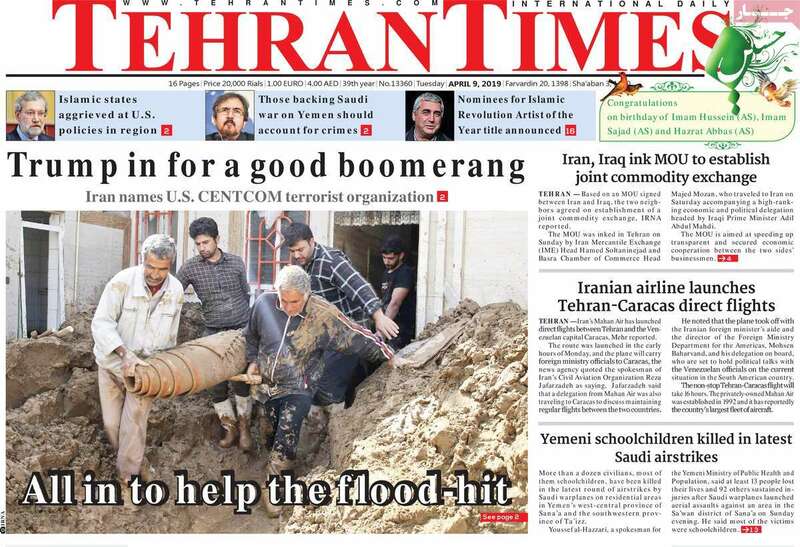 However, now the UN in Iran says the international organization has opened a special financial channel to funnel the cash donations to the survivors of recent devastating floods in Iran. "The United Nations has established a banking channel so cash assistance makes their its way into Iran," UN Resident Coordinator and Representative of Secretary General in Iran, Ugochi Daniels told reporters on Monday in Tehran. "This is the result of efforts that have been made at the UN headquarters," she added. Her remarks come at a time when Iranian officials have criticised the US sanctions for blocking all banking channels that allow international donation for flood assistance be transferred to the Iranian Red Crescent Society, a humanitarian organization. "The UN has always reiterated support for the JCPOA (Iran nuclear deal of 2015) and declared that US sanctions are not lawful," she stressed. Daniels added that part of the aid supplies that have been arrived in Iran were purchased from outside Iran. She emphasized that there are efforts being made at the highest levels of the UN not to allow that humanitarian aid be blocked from being sent to Iran. 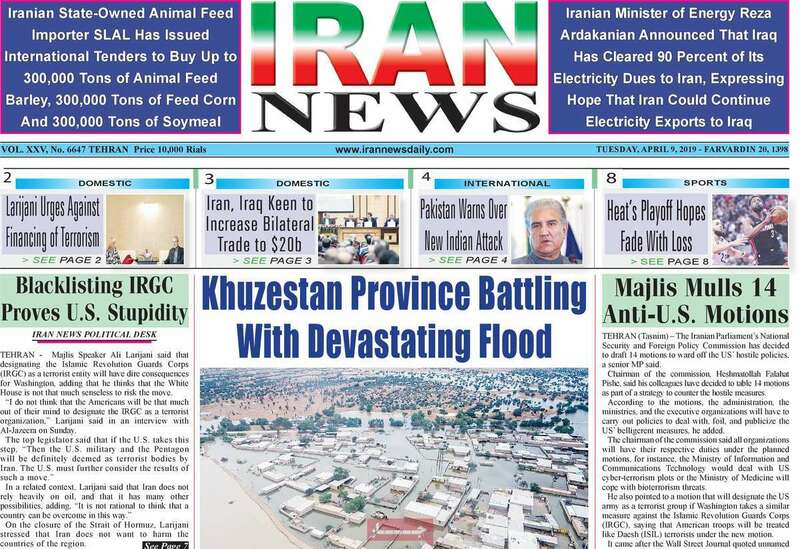 The UN resident coordinator in Iran said that UN has allocated $1,420,000 for fast assistance and provide water, sanitation and hygiene (WASH), health and shelter for those devastated by the floods. 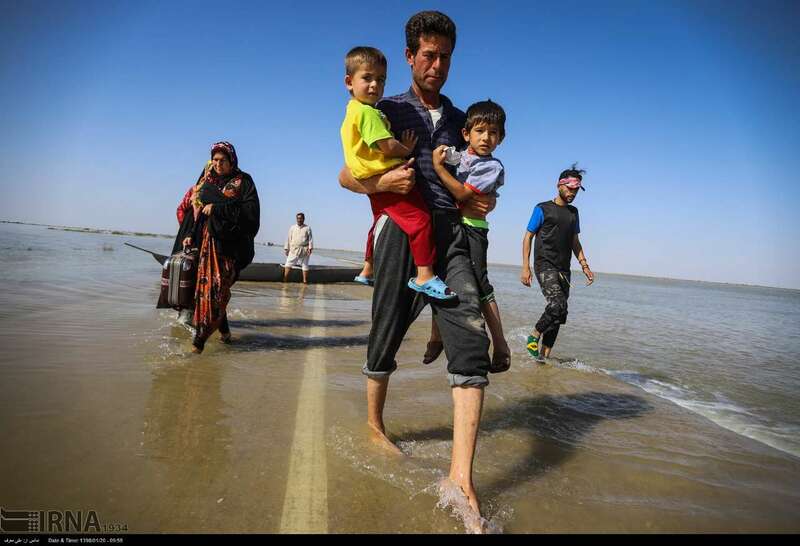 Also the United Nations International Children's Emergency Fund (UNICEF) will send aid supplies to the Ministry of Health for immunization of flood-affected areas as well as nutrition of young children in those areas, according to a statement by the UNICEF office in Iran.